Thank you for supporting our mission to advance the intellectual vitality, knowledge, and creativity of the Portland State University community! Here we highlight a few of the generous gifts that have facilitated student success at Portland State. See “Giving Opportunities” to learn more about ways to give. 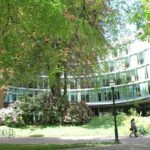 During Tom Pfingsten’s 23 years as director of Portland State University Library, the collection doubled, the building was expanded and renovated twice, and technological advances provided more convenient access to materials. Tom and his wife have established the Tom and Ann Pfingsten Endowed Library Fund to support the library’s greatest needs and create a legacy for library excellence. The PSU Library supports nearly 30,000 students as they explore, learn, and engage with their various fields of study. Each student has an individual experience with the library that we strive to consider with every decision we make about services, instruction and information resources. Our partners in the Colleges and Departments have a long history of supporting individual students with scholarships and financial support and the Library has not been able provide this kind of support. Until now. With the average student graduating from PSU with nearly $27,000 in debt, we have decided to find another model for supporting our students with direct financial support. In the Library world we often find that people are either savers or spring cleaners. Some people purge their file cabinets regularly, while others save every note and file. Our Special Collections and University Archives depend on donations from generous savers to keep history alive and accessible to our current and future students, faculty and greater Northwest community. Access to art history textbooks—because of their color plates and high quality printing—can represent a significant obstacle for a college student with limited means. The cost may even be enough to deter some students from studying art at all. For art lover Robin Holmes, that would be inconsistent with the concept of a broad university education. 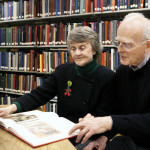 That’s why she and her husband Robert sponsored a large art textbook collection — not only to help art history majors, but especially non-majors who want to branch out into new interests. Special thanks to the Holmes for this gift and for contributing to flexible endowments supporting travel and training for future educators in fine arts. 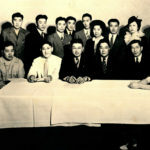 The Japanese American Citizens League is the country’s oldest Asian American organization dedicated to preserving civil rights in the United States. The Portland JACL collection includes scrapbooks, photographs, programs, meeting minutes, and many more important documents dating from before WWII to the 1980s. 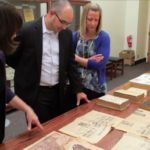 The JACL collection is currently available to students and patrons and with the help of the Portland Chapter of the Japanese American Citizens League and the Oregon Cultural Trust, efforts are underway to ensure that these historically important documents will continue to be available in the future. Sit down with Bob Rawson (‘58 Secondary Education) and you’re likely to hear some great stories about his time in the Peace Corps in Sierra Leone, his many years teaching Government to high school students, or his recent forays into family genealogy, where he discovered his family has a connection to the Salem witch trials of the 1690s. In retirement, Bob keeps busy through participating in theater and reading to children at PSU’s daycare. 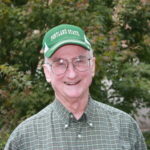 Bob is also a generous donor to Portland State, particularly the Library. He established an endowed fund through charitable gift annuities and named the PSU Scholarship Fund and the Library as a beneficiary of his estate. 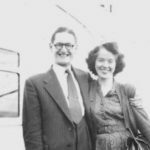 The Butler Award for Library Service was created by Ken and Elsie Butler in 1999. Ken was active in building library collections as the Assistant Library Director and was an advocate for library funding. Ken was very proud of his faculty status as a full professor at Portland State Library, and the award was created to recognize the excellence in library faculty service at PSU. 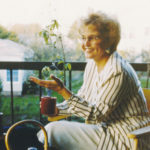 His wife, Elsie “Rusty” Butler was a librarian in the Multnomah County library system and lived a life of dedicated service to her county and patrons. Both Ken and Rusty exemplified the excellence in librarianship we strive for everyday at the Portland State University Library. The Dark Horse Comics Collection at the Portland State University Library provides a unique legacy for Oregon’s premier comics company. Dark Horse Comics was founded in 1986 by PSU alumni Mike Richardson, Class of 1977, as an offshoot of his comic book retail chain, Pegasus Books. 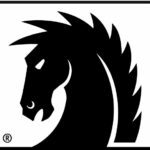 Dark Horse has since grown to become the third largest American comics company. PSU alumni, Neil Hankerson, Class of 1972, joined the company in 1987 and became its Executive Vice President. This gift provides copies of all materials produced by Dark Horse, resulting in a complete and preserved collection of the Dark Horse corpus.